Timothy James Leary was born on December 23, 1958 in Santa Monica California. The golden boy was a star pitcher at UCLA and considered a highly touted prospect. He struck out 16 batters in 17 innings in the 1978 Amateur World Series. Leary went 2-1 taking the loss as Team USA lost the final game against Cuba to win the Bronze Medal. 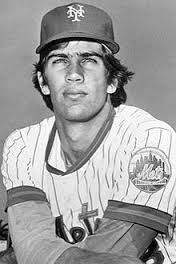 The Mets drafted him in the first round (the second pick overall) in the 1979 draft. In 1980 he won the Texas League MVP Award with the Jackson, Mets. The next year, the Mets thought he was ready; he made his MLB debut on April 12, 1981 at Wrigley Field. He pitched only two innings striking out three Cubs. It was his only start of the year, as an elbow injury shut him down and he didn’t resurface on the Met roster until September of 1983. In two games that month he went 1-1 allowing 10 runs (four earned) on 15 hits. His win was a complete game victory against the Expos on the last day of the season. With the emergence of Dwight Gooden, Ron Darling & Sid Fernandez, Leary found himself in the bullpen. In 1984 Leary got the win in relief on the 5th game of the season. He would pitch in 20 games, going 3-3 with a 4.02 ERA going into July before he was sent back down. 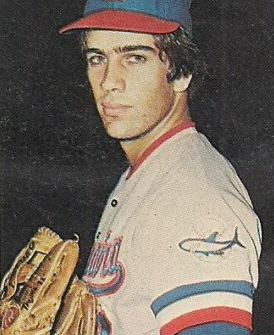 In January of 1985 he was part of a four team trade that sent him to Milwaukee and the Mets received a pitcher named Frank Wiills, who never pitched an MLB game for them. As the Mets were winning the World Series in 1986, Leary went 12-12 in Milwaukee pitching in his first full season. 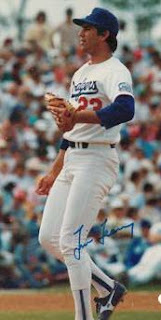 He was then traded back home to Los Angeles along with Tim Crews for Greg Brock. He fell to 3-11 and was back in the bullpen. He turned it all around in 1988, winning the Comeback Player of the Year, a Silver Slugger Award and a World Series with the Dodgers. Leary went 17-11 with a 2.91 ERA, 180 strikeouts, while pitching in 228 innings. The Mets roughed him up in Game #6 of the NLCS getting him for four runs in four innings pitched, as he took the loss. He pitched two games of relief in the World Series against Oakland, allowing only one run on six hits in 6.2 innings pitched. His career took another down fall as he lost 14 games in 1989 getting traded to the Reds. In 1990 he was on the AL New York team, and led the league with 19 losses and 23 wild pitches. He lost 10 games with losing records in each of the next two seasons, before winning 11 games in Seattle in 1993 (11-9). He finished his career in Texas. After a 13 years career Leary went 78-105 posting a 4.36 ERA with 888 strike outs in 1491 innings pitched in 292 career games. Retirement: After his playing days he was a pitching coach at UCLA & more recently at Loyola Marymount University. He resides in the Pacific Palisades.